Elite A/V is a Las Vegas Based Audio/Video Systems Integration Company Offering Sales & Installation on Today's Newest Home Technology. As our Client you get Red Carpet Treatment & We Guarantee All Our Work and Wires For Life. We specialize in Home Automation and Lighting Control. We also have expertise in Home Theaters, HDTV Set-ups, Multi-room Audio Systems, Universal Control Systems, Shade Control, Networking and Wireless Solutions. Give us a call today to speak with one of our System Design Specialists and ask about our Trade-Up Program! We will work one on one with you to customize your system to fit your lifestyle and budget. Don't forget, People Love Us On Yelp! HP Media Group believes that the success of any sized project begins with a solid design and proper engineering. Our years of experience working with some of the most discriminating clientele has given us an intimate knowledge of what clients actually want, what products work together to deliver those solutions, as well as which products don’t work, or play well together. This same experience has shown us what particular system features our clients actually use and appreciate, and which items are just a waste of time and money. With this knowledge in hand we can greatly simplify the operation of every system we design by eliminating unneeded buttons and other unused functions, focusing instead on what is truly important to our clients. As the owner of HP Media Group, Kevin coordinates, manages and leads a team involved in all aspects the business, including sales, design, and engineering. Kevin Peltier is a qualified Electrical Engineer and holds the degree of Bachelor of Science in Electrical Engineering from UNLV. 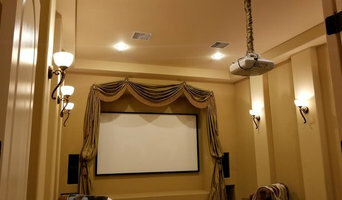 Passionate about elevating the quality of life through different media services and products in the home, Kevin helps homeowners at every stage to create their own private theater, or ideal whole home media system, from design and installation, to the service provided long after the job is completed. From simple elegance to whimsical designs, we create home theater systems like no other for our clients. We want to create what you envision while satisfying your every need and desire for the perfect movie watching experience. Count on us to bring the Theatre experience to your home! Here at Dream Theater Logistics we carry the finest audio brands available that can not be found at big box stores. We have employed the best installers in the nation. Rest assure that the technicians responsible for installing your Dream Theater has a in depth background in audio. We also specialize in audio/video repairs. 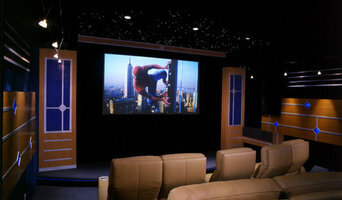 To set up your home theatre installation, please contact us at your convenience. We look forward to meeting you soon! COME CELEBRATE WITH US! It's our 20th Anniversary We are inviting both our clients and industry partners and we would love for you to come and spend the day away with us. Details: - May 4th, 2019 - 11:00am - 3:00pm - 6008 S. Fort Apache Road Food and Drinks by Ricardo's, cool new tech and raffle prizes, fund raiser for the Wounded Warrior Project and silent auction. ____________________________________ For the past 20 years, with our hard work and strong dedication and passion to our industry, we have positioned ourselves to be Las Vegas’ Greatest Audio/Video store. We have developed and maintained strong customer relationships with some of Las Vegas’ finest residents. Premiere Audio Video Integration has a unique training facility in our showroom that provides all of our employees with the highest level of in-house industry training. This also allows us to bring in manufacturers to provide in-house training to all of our technicians. Las Vegas’ Greatest Showroom allows our customers to experience Audio/Video at all different levels and at all different price-ranges. Our showroom provides a comfortable, relaxed and enjoyable atmosphere for all of our clients. So bring in your favorite BluRay or your favorite CD and let us show you why we are #1 in Las Vegas! We can talk to you all day long about how great Premiere Audio Video Integration is… but until you come in and experience Premiere for yourself, you will truly never understand the power of Las Vegas’ Greatest Audio/Video Store! We have years of experience in Designing, Wiring, Installation and Programming. Our highly respected team is currently servicing Las Vegas, Lake Tahoe, Reno and Southern California on call. We are dedicated to the excellence in creating and designing your entertainment, luxury and convenience. Our Company’s objective is to meet and exceed our client’s expectations by engineering reliable Integrated Audio/Video and Automation Systems that are simple to use. Using our collective abilities and experience, along with a proven line-up of electronics manufactures, our engineered systems provide repeatable reliability and lasting value. Whether you are building a new home or simply remodeling an existing one, Eagle Sentry will integrate state-of-the-art electronic solutions and make them easy for you to operate and control. Our entire team is committed to providing you the best level of quality and care. Eagle Sentry takes pride in our ability to create home audio/visual, security and integrated systems that are inspired by the imaginations of our customers. You'll feel confident knowing that Eagle Sentry is Southern Nevada's leading custom electronics design and installation company. Since 1986, our reputation for quality, innovation and professionalism has been carefully built with thousands of successful installations. We're surrounded by the convenience of technology. It's in our vehicles to help us identify a problem, in our workplace to increase efficiency and productivity, and in our pockets to keep us in touch. Progressive Home brings that same convenience home. We work with homeowners to create an exciting living experience with home technology while increasing home value. As Nevada's largest and most recognized provider of home electronic system integration services, we provide innovative solutions and reliable customer service. From home security to home entertainment, we help you create an environment that conveniently brings technology into everyday living. Hometronic of Las Vegas, NV, can design and install a high-quality, state-of-the-art ADT monitored home security system to help keep your home and family safe. We make a point to completely understand your security concerns and needs for your home and build a customized solution based on these factors. These solutions may include an ADT monitored home security/burglar alarm system, security cameras or a fire alarm and it would all be accessible for you from the internet or your mobile phone. The capabilities of this technology has increased substantially in recent years and at Hometronic, we are prepared to bring it into your home at an affordable price. Big Boss Productions is the leader in systems integration and smart home design, specializing in the installation of structured wiring, distributed audio, lighting control, dedicated theater, automation, security alarms, security cameras, intercom, VOIP phone systems, and much more. We stay on the cutting edge of technology while using energy management systems to meet the ever changing needs of our customers. From entertainment systems to conference rooms to hospitality systems, Big Boss Productions specializes in both residential and commercial audio video markets. Discount Billiard Services Co is one of the most well-known pool table service company in southern Nevada. Our pool table service includes installing a pool table, disassembling a pool table, relocating a pool table, recovering a pool table, and all other repairs on all makes and model pool tables. We know that the most important part of buying or moving a new or used pool table is how well it is put together. I have installed thousands of pool tables through the years and have seen almost everything with every brand of table. Call Today! Discount Billiard Service Co. is Las Vegas's oldest (with over 25 years experience), most trusted, and experienced! We provide complete EXCELIENT billiard services by certified technicions at LOW prices. All services are backed with a 100% satisfaction guarantee! and a lifetime warranty on a perfectly level pool table! We offer truly customized solutions for large systems, commercial or residential. Our 31 years of experience gives us an advantage others do not have. From conceptual design, engineered drawings, documented installation, electronic systems setup and programming, system diagnostics and repair we will strive to serve your needs. Master Installers, Inc. is a small business with big business experience and capabilities. It has enjoyed a sterling reputation for high quality residential and commercial installation, service, and support in low voltage systems for 15 years. Since its beginning in 1997, Master Installers, Inc. has built its reputation for outstanding design, installation and services to Las Vegas and the surrounding areas. Master Installers listens to its customers describe their needs, wants and requirements and then provides a complete package with prompt service and fair pricing that consistently meets or exceeds their expectations. Our highly trained team and dedicated staff offer over 35 years of experience in the low voltage field. This allows us to be confident that any of our projects will be completed with the highest standards and efficiency. We are constantly working with manufacturers, home owners, and builders to keep our company on the top of changing technology, technical training for our staff, and system integration. 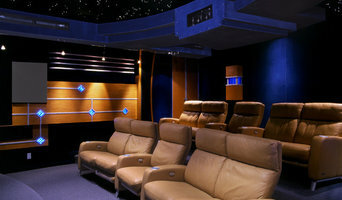 Creative Home Theatre is Nevada’s premier Custom Home Theater Design Company. Creative provides Home Theater and Integrated Technologies to clientele who appreciate good quality and have the desire to incorporate new technologies into their day to day lives. Home media specialists not only can design the seating and decor for your dream home theater, but most of them can help you find specific media control options, conceal your television and various accessories, set up optimal seating, choose and install ideal lighting, and help create the ultimate viewing environment. Some of these Nevada professionals work entirely on their own, while others work with subcontractors to get the job done. Here are some related professionals and vendors to complement the work of home automation & home media: General Contractors, Interior Designers & Decorators, Paint & Wall Covering Dealers, Furniture & Accessories, Specialty Contractors. Find a home media designer on Houzz. Narrow your search in the Professionals section of the website to Las Vegas, NV home media designers. You can also look through Las Vegas, NV photos by style to find a room you like, then contact the professional who designed it.